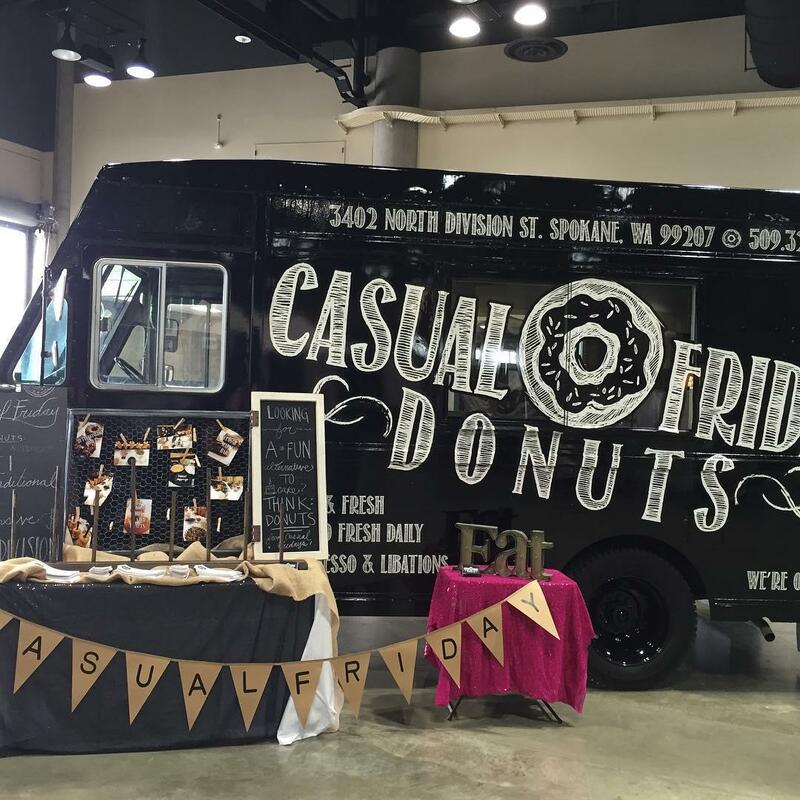 UPDATED: Mon., Oct. 15, 2018, 9:16 p.m.
How long does it take three Spokane police squad cars to find a missing doughnut truck? Not long. The Great Doughnut Heist of 2018 began Monday at about 5 a.m. at Casual Friday Donuts, the popular doughnut destination at 3402 N. Division St. on the corner of Division and Courtland Avenue. Amber Owens, who runs the shop with her husband, Joe Owens, said a worker had left a mid-’70s black Dodge van running in the store’s parking lot for about five minutes while it warmed up. But when he returned, no van. Only empty space and debris. “They all came out and looked around to see if they could see it,” Owens said. They immediately suspected theft. So they called 911, and within minutes, three squad cars were on the scene. Luckily, the officers didn’t need to look far – just south and down the hill, across Courtland Avenue and balancing on a short retaining wall at the Asian World Food Market, was the truck. Nobody was injured. But as it turns out, the van likely wasn’t stolen. Owens doesn’t buy it. She said the worker had parked it in such a way that if it did roll, it would have gone west – not south – straight into northbound Division traffic. And then there’s a doughnut thief who is behind a string of thefts at the store’s dumpster, which is fenced and locked up. At least once a month, Owens said, someone breaks the lock and fishes the doughnuts out of the bin. The culprit then will arrange them on top of the lid like a police lineup, picking out a favorite assortment before leaving the least favorites behind. Owens suspects the same person who steals the product stole the van. But because it’s a manual transmission and hard to operate, she believes they took it for a joyride around the block and abandoned it at the short wall when things didn’t go as planned. Published: Oct. 15, 2018, 4:31 p.m. Updated: Oct. 15, 2018, 9:16 p.m.